This is where I usually get my fruit. I’m not exactly tall, so it’s a bit of a bother. But after careful reflection, I think that you will agree that this is the only real choice. This is where most people get their fruit. It is also where people who get their fruit from 1 put rejected fruit that, for some reason, does not meet their exacting standards. This is where little old ladies get their fruit. It is also where people who get their fruit from 2 put rejected fruit that, for some reason, does not meet their somewhat loose standards. This turns out to be not much of a problem, because these ladies are old enough to remember what actual fruit looks like from nature, so they expect their fruit to look more or less like this. This is where the 3 year olds grab the fruit and lick it when their parents are not looking. Interesting. I see your logic. I often will look for another location for the seasonal fruit. Sometimes they’ll have the main display, then other ones off to the side. It seems like the side display is less picked-over. 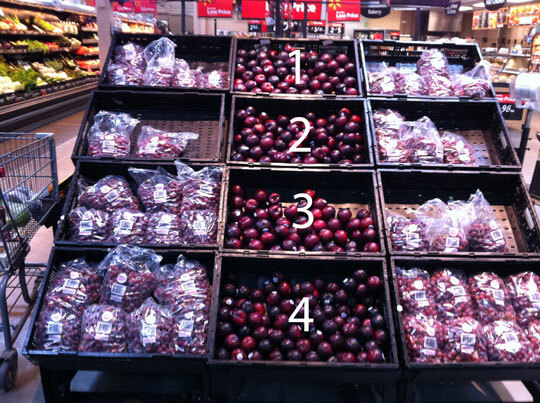 Choice #4 is why I choose to get my fruit from Skittles. Too funny! Did you witness the ritual of the #4 bin? Makes you REALLY want to go home and wash your fruit. Who cares about the poisonous pesticides -- get that kid slobber off my fruit!